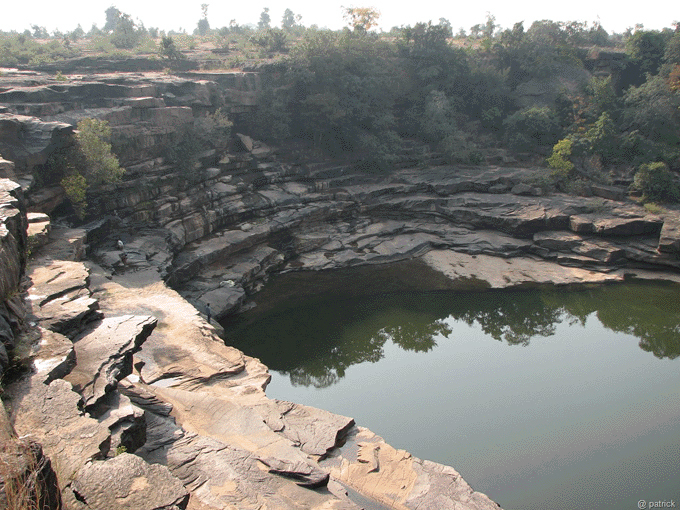 The allure of Chitrakoot is both the beauty of the city and its ancient legacy. Called the a town of ‘holy wonders’ , Chitrakoot is edges the Vindhya ranges and the bank of the Mandakini river. For me, the town is full of fascination. It is here Lord Rama, Sita and Lakshman spent eleven of their fourteen year exile. Inspired by the local serenity and holy legacy, Tulsidas wrote his epic poem of Ramas life, the Ramacharitramanas. According to surveys Sita Devi is the most popular divine heroine, yet NGO’s paint her a model of the oppressed female. For me, she exemplifies the power of quiet female resistance. 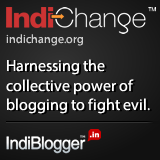 She was Gandhi’s symbol of passive resistance and non violent struggle. I see Rama as the divine loving, but disempowered, husband under the absolute authority of a father king submissive until he can assume the throne. Turn to Rajasthan or distant villagers, and women do not moan of oppression but sing of a quiet but protesting Sita, with lyrics at times directed to remind themselves of their own female strength within the home. At Ramghat devotees dip in the Mandakini at sunrise to invoke divine blessing, constantly Rama bhaktas meditaté on the Ramas life in Rama-lila. In the evening Each evening, sadhus line the ghats offering arotika, while devotees bathe. Above the ghat steps leap to the Matha Gajendranath Shiva Temple where Brahma performed penance and offered a shivaling considered a kshetrapal or proector of the area. Like Varnasi, long stretches of steps line the Mandakini River. South of the main bathing area at the Raghav-prayag ghat is a confluence of the Mandakini, Payaswini, and Gayatra (or Savitri) Rivers, not visible to the eye. This is why the Mandakini is sometimes called the Payaswini. It is here that Rama performed pitra tarpan, or offerings to his father, King Dasarath, who departed after Rama went into exile. The Mandakini River originates from an ancient gorge 50 kilometres to the south. Beside the Raghava-prayag ghat, but to the north of the Ramghat, is Bharat Ghat, where Sri Bharat bathed. Ramaghat is also famous for the poet Tulsidas who it is claimed kindly applied sandal paste to the foreheads of Rama and who had appeared as children. With Hunuman’s help he hen recognised Rama’s identity. After bathing in the Mandakini, devotees perform parikrama around Chitrakoot dhama, which begins with darshan of Lord Kamtanath. Devotees perform parikrama around the complex of tirthas, collectively known as Puri. Be sure to visit the Mattgajendreshwar Swami mandir, Parna Kuti, and Yagya Vedi. 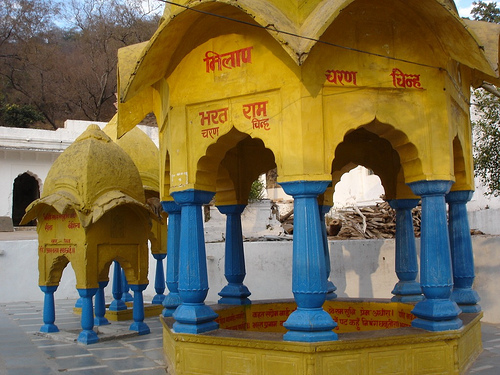 The King of Panna, Raja Aman Singh, built the Mattagajendreshwar Temple where, the Puranas claim, Brahma offered penance during the Satya yuga, and installed a Shiva-linga, known as Mattgajendreshwar Swami, as Kshetrapal, or the protector of this tirtha. Later, Rama performed Rudra abhisheka here. A wooded hill five kilometres away is a white fortress shine approached by approximately 360 steps before seeing the five faced panchmukhi idol of Hunaman cooling water gushing from under a rock named Hanuman Dhara. Kamadgiri, the hill that fulfils all desires is said to embody rama. Pilgrims circumambulate the hill , or perform parikrama. The path passes numerous shrines and temples including the Bharat Milap Temple where Rama’s younger brother met Rama to try and convince him to return to Ayodhya. 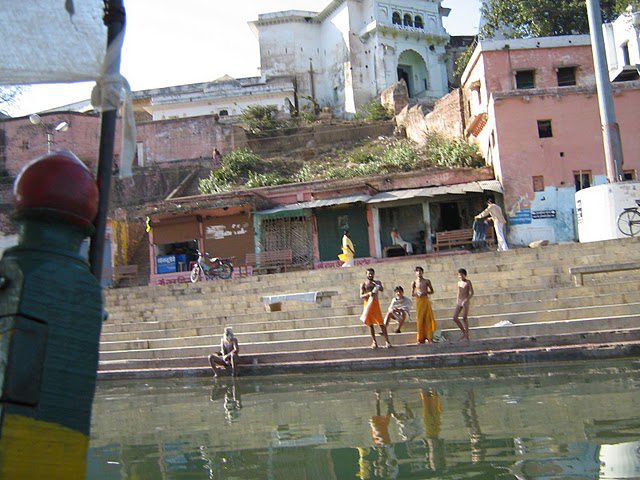 A boat ride upstream from Ramghat leads to Janaki Kund where Sita is said to bathe during their exile, decorated by her footprints. 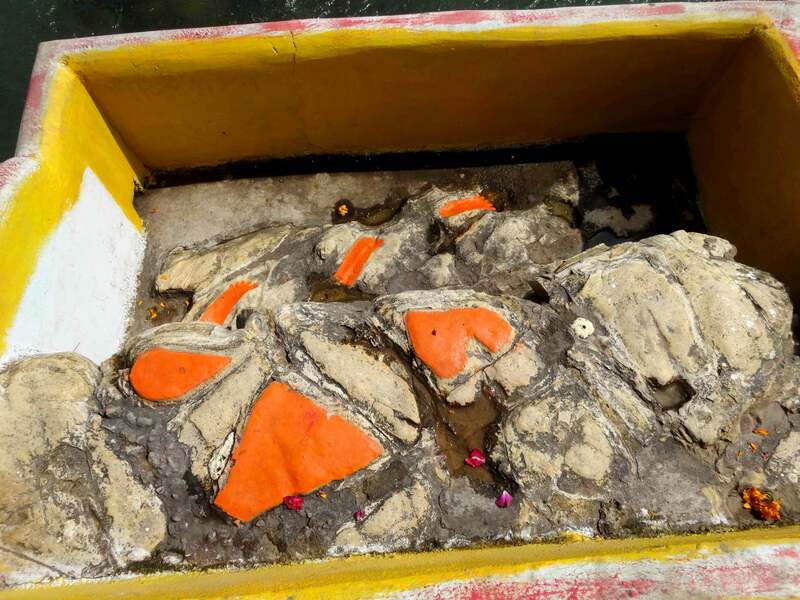 Further on, a boulder called Shaatik Shila is a footprint impression claimed to be of Lord Rama. Sixteen kilometres from Chitrakoo set in forest is Atri Anasuya Ashram dedicated to the sage Atri and his wife Anusuya. Gupt-Godavari has two caves with two natural throne like rocks which locals believe were where Rama and Lzakshman held court. 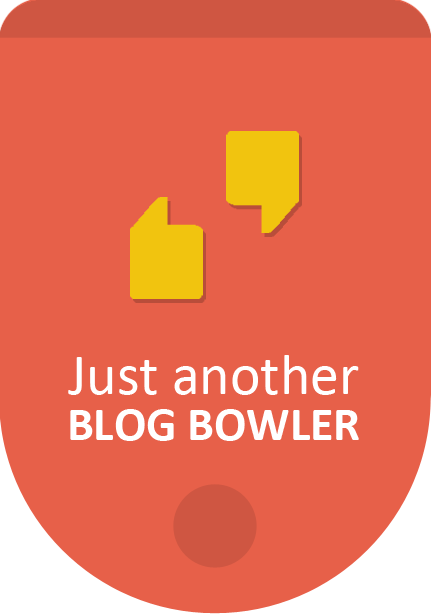 In one is a a shallow tank fed by a stream called Sita Kund.